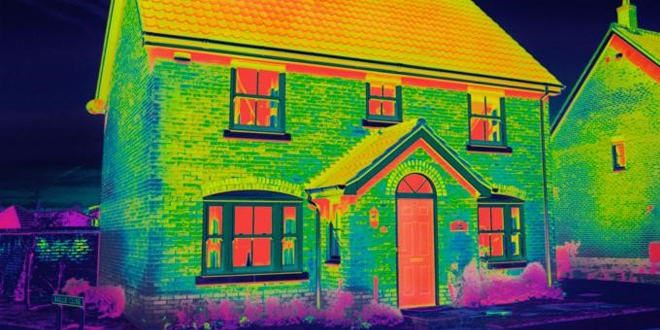 Britain’s houses are some of the oldest and coldest in Europe and the cost of heat that leaks from properties is leading to a rise in fuel poverty. Because of this, experts at Everest conducted an analysis of over 15 million properties across the country revealing the areas that are the most and least energy efficient based on EPC ratings. Despite being one of the most expensive places to live – London is home to the MOST energy efficient properties in the country (most A- & B-rated EPCs). Tower Hamlets, Greenwich and City of London top the chart as the three most energy efficient areas according to the data. 29% of Tower Hamlet properties received an A- or B-rated EPC – which is the highest across the country. Followed by Greenwich and City of London with 20% retrospectively. There has been significant investment in London and Tower Hamlets specifically from local governments. When looking outside of London, Dartford (Kent), Uttlesford (Essex), and Basingstoke and Deane (Hampshire) are amongst the top 10 best areas with the most top rated EPCs. Homes with an A- or B-rated EPC spend on average £1,104 on their energy bills over 3 years. And those that are benefiting from cheaper bills, are situated within or near the capital. However, the data shows that just 19,832 dwellings benefit from an A- or B-rated EPC. Most dwellings have a D rating that has energy costs, on average, of £3,228 across 3 years. 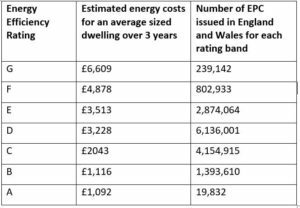 There are 6,136,001 dwellings in England Wales with an average D-rated EPC. However, the problem lies amongst the lowest rated homes. Isles of Scilly, Gwynedd, and Ceredigion are the three WORST areas. A huge 35% of properties within the Isles of Scilly received an F- or G-rated EPC – the worst grade possible. Most properties across the west fringes of the country are not suitable for cavity wall insulation due to the fact they are highly exposed to wind and driven rain. This can cause problems with damp and mould in the walls and affecting the health of homeowners living in the dwelling. If your house is suitable (seek professional advice) for cavity wall insulation you can expect a considerable retention of the third of heat lost through uninsulated walls. Older windows can be responsible for 40% of the heat loss in your house. Installing high performance glazing will make a significant difference to the energy efficiency of a home. To understand what the independent ratings for different windows and glazing mean, this page explains what to look for in an energy-efficient window. Installing LED bulbs in all lamps and lighting fixtures is a cheap and easy way to improve your EPC rating (although marginally). An EPC rating is calculated on the cost of energy that supplies your heating system. As heating is a considerable chunk of your energy costs at 55% this is where significant saving and improvements to your bills and your EPC ratings can be made. By replacing an old boiler that has an appliance rating of ‘G’ with a new A-rated boiler that includes a programmer and thermostat, an annual saving of £305 can be made (based on a detached house). If your home has implemented all other energy efficiency measures then installing solar panels, biomass boilers and ground-source heat pumps will dramatically increase an EPC rating. By installing solar panels a G-rated, semi-detached house could make a saving of £311 per year. Do you trust the energy saving claims on the products you fit?